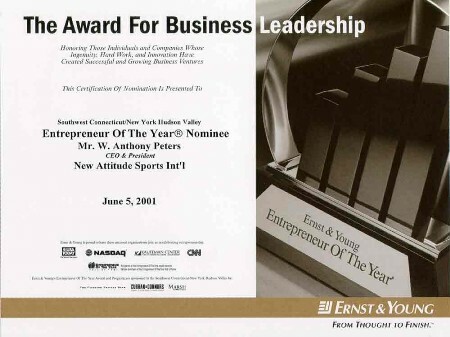 Tony Peters, CEO & President of New Attitude Sports International, has been nominated 2001 Entrepreneur of the Year. The coveted award is given annually by renown professional services firm Ernst & Young to recognize individuals and companies whose ingenuity, hard work, and innovation have created successful and growing business ventures. "I am delighted to receive such a high honor from a firm as prestigious as Ernst &Young. Further, the nomination confirms that we are fulfilling our corporate mission of building a strong brand name for quality products from multi-cultural designs. We must be doing the right thing when others stand up and take note. This is very exciting and the kind of recognition that makes all the hard work worthwhile," says Peters.